OK, so that sucked. I went 0-5 last week as Edmonton and Minnesota each won in the other’s barn, the Wings pulled off a couple of wins, and the Stealth grabbed a first-place tie in the West. Every team is in action this weekend (and this week, since Toronto and Buffalo play a rare Thursday night game), and the Bandits play twice. BUF @ TOR Buffalo has a winning record in Toronto, but the Rock are the top team in the league right now. If Cosmo plays like he did two weeks ago this could be a tough one for the Rock. Nick Rose has allowed 12, 13, and 12 goals in their last three games so he might have to take it up a notch, especially with John Tavares returning. PHI @ BUF Both teams are 4-3, both 2-2 at home. Buffalo has scored two more goals and allowed one more than Philly. Couldn’t really get more even. I’ll give this one to Buffalo because they’re at home. EDM @ CAL The Roughnecks have lost two of their last three but this is their first home game in a few weeks. I think Calgary is still the team to beat in the West. MIN @ WAS Speaking of Championship game to the basement in one year, now the Stealth are trying to go the other direction in one year. I’m not sure they can get all the way there, but in a one-and-done playoff format, anything’s possible. Meanwhile, the Swarm have lost their captain for the rest of the season. How will this young team handle the loss of their leader? Think of all the Native players that have played for the Bandits or more recently the Knighthawks – far too many to list. I’m sure there have been plenty of times where each of them has had five Natives on the floor at the same time, let alone five over fourteen years. So why the difference? Is there some kind of an anti-Native policy on the Rock? I seriously doubt it. First off, they wouldn’t have signed Vyse. Secondly, this has been the case for the entire history of the Rock, through a number of coaches, GMs, and even owners. And thirdly, only an idiot GM would make player decisions based on race over ability and nobody would call Les Bartley or Terry Sanderson (the GMs of the Rock for most of its existence) idiots. This is a pure guess on my part, but I suspect it has little to do with the Rock and more to do with the Bandits and Knighthawks. Natives see a lot of other Natives, many of whom they grew up playing with or against, playing for those teams and want to go play with those players. It then becomes self-fulfilling – the more Natives play there, the more Natives want to play there. If you’re a GM from Six Nations (as both Darris Kilgour and Curt Styres are), you’re more familiar with players from Six Nations, again because they live near you and you have watched them play for years. As a result, you’re going to be more likely to draft them – same reason Terry Sanderson picks so many Orangeville guys. Coincidentally, every one of these five players played for the Bandits either before or after playing for the Rock, and Kim Squire and Jason Henhawk also played for the Knighthawks. 2-3 last week. Not bad, but continually having weeks under .500 will not help me make it to .500 overall. I called Edmonton’s win over Colorado and Calgary’s over Minnesota, but said that Calgary scared me in the Toronto game (they weren’t that scary) and that Buffalo would struggle without JT against the awesome firepower of the Knighthawks. Turns out the Bandits didn’t need much firepower themselves, and Rochester didn’t bring theirs anyway. Some tough ones this week – will Edmonton continue their hot streak in back-to-back games against the Swarm? Will Philadelphia get some payback for the beating they took from Rochester a couple of weeks ago? What will happen when the worst and second-worst teams face off in Philly? MIN @ EDM Two underperforming teams face off twice this weekend. Edmonton broke out last weekend with two wins, but Minnesota has yet to do that. This could be the weekend they do, but I think Edmonton will ride their winning streak into their home arena and take the first game. PHI @ ROC Making picks for the Knighthawks is difficult because there seem to be two Knighthawks teams – the reigning champs from last year who demolished the Wings a couple of weeks ago, and the other team that only scored 6 against Buffalo last weekend and lost their first three. 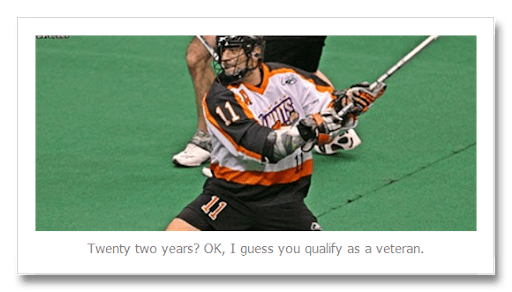 I remember saying this about the Knighthawks last year too. That said, Casey Powell should be back this weekend and the Hawks not going to be happy with last week’s game. 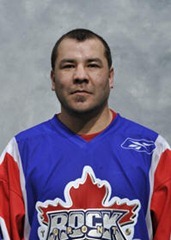 CAL @ WAS Despite their loss in Toronto last weekend, the Roughnecks are still a scary good team. But they know that the Stealth are right behind them in the standings and cannot be taken for granted. If I had to choose my least confident pick this week, this would be it. EDM @ MIN Minnesota’s home field advantage is pretty significant – they were 6-2 last year at home and are 2-1 this year (while 0-3 away), so I have to give this one to the Swarm. COL @ PHI Colorado’s been one of the biggest surprises this year. Sure they’ve had goaltending issues, but that’s not the extent of their problems. Only one team has scored fewer goals/game than the Mammoth (11) and that’s the Wings (10.4). Last year, nobody scored more than the Mammoth. They gotta start scoring sometime, don’t they? Faceoff dominance: Does it help you win? Over the last decade or so, a few players have stood out as excellent face-off men. Washington’s Bob Snider and his brother, Calgary’s Geoff Snider, are the cream of the crop right now, and in recent years Peter Jacobs, Jamie Hanford, and Jamison Koesterer have also made names for themselves in the circle. But does it really matter? Logic says yes. When you win a face-off, you gain possession and in lacrosse, possession is everything. If you win 75-80% of your face-offs, as the Snider boys do with regularity, that’s 10-15 extra possessions per game for your team, and at least a few of those have to translate into goals, right? But do the stats bear that out? As we frequently do on this blog, let’s look at the numbers and see if they support something that “everybody knows”. For those of you who don’t care to look at the actual numbers, here’s the “too long; didn’t read” version: Yes, but not by very much. Feel free to skip to the conclusion now. I only have sufficient stats for the 2012 season, so we’ll have to restrict the numbers to that season. There were 72 games played during the regular season, and therefore 72 winners. Three of the 72 games finished with a tie in faceoffs, so we won’t count those three. Of the 69 remaining games, the winning team led in faceoffs 39 times (56.5%). This means that in 30 of the games (43.5%), the winning team won fewer faceoffs than the losing team. So it looks like winning the faceoff battle does give you a slight edge. But let’s look even further. If we look at games where one team really dominated the faceoffs, say winning 70% or more, we find the opposite. There were 28 such games last year, and the team that won the faceoff battle only won 13 (46%) of them. Of the 15 games where the losing team won 70% or more of the faceoffs, the teams break down like this: Washington 8, Philadelphia 3, Calgary 3, and Minnesota 1. The Stealth lost eight games (and won three) while winning 70+% of the faceoffs. Of course, this is a strange case – the team with the best face-off man in the league and the worst record. This is also the record of one team over only 16 games. Calgary, for example, went 5-3 in games where they won 70+% of faceoffs. Even if we look at the season as a whole, that one team dominates so much that the numbers are too skewed to be meaningful. Not surprisingly, we can’t honestly say that winning 70% of the faceoffs means you’re less likely to win the game. The conclusion to all of this is that during the 2012 season, teams won 56.5% of games in which they won more faceoffs than their opponents. I’ve done the calculations for the 2013 season as well (less than half over), and through 31 games (one game tied), everything is exactly 50-50 – winning teams have also led in faceoffs 50% of the time. This tells me that winning the battle of the faceoffs does give your team a greater chance to win, but not by as much as you might think. I mentioned in my Week 7 picks article that Calgary scares me. They have arguably the best offense in the league, one of the best face-off men in the league, quick transition, a strong defense, and lots of toughness up and down the lineup. Oh yeah, and the reigning goaltender of the year. They’ve won four in a row, two of those by 7+ goals. There’s no question that the Roughnecks are one of the toughest teams to beat in the league, and that’s the team we saw tonight. For the rest of the game they looked like just another pretty good lacrosse team. They certainly had flashes of brilliance – Poulin made a few great stops, the Roughnecks defense was pretty stifling all night long, and they scored a couple of goals that I, a Rock fan, even applauded. Shawn Evans didn’t score but dished out some pretty nice feeds. Dane Dobbie was on fire, and Shattler, Dickson, and Ranger had some pretty nice goals as well. But penalty trouble was the name of the game for the Roughnecks, as they gave the Rock 12 power play opportunities, 9 of which were converted. The Rock started the game with the yips – shots going everywhere, dropped balls, fancy behind-the-back passes to nobody. It looked like the first game of the season out there – assuming nobody had picked up a lacrosse stick during the off-season. But things gradually came together and after being down 5-2 and 6-3, the Rock went on a 11-1 run including five straight power play goals in the third. Early in the second quarter, Garrett Billings scored an unbelievable behind-the-back no-look short-side goal and I mentioned on twitter that it “may be the most beautiful lacrosse goal ever scored in the history of the world” and was only partially kidding. But later in the same quarter, Billings scored another from almost the same place but this one was far side. I swear it looked like the ball curved after he shot it, since the space between Poulin’s arm and the post was almost nonexistent. As I said, penalties caused the Roughnecks trouble all night, none more than Geoff Snider’s ejection early in the third. He was having his usual ho hum 78% face-off night, when he seemed to lose his mind and go after Scott Evans. Evans decided that fighting Snider was a bad idea (can’t blame him) and tried to walk away. Snider, who had hold of his jersey, pulled him back and started pummeling him. Refs quickly broke it up, but Snider was given 2 for instigating, 5 for fighting, and a game misconduct. The 2 and the 5 I get, but I honestly don’t know what earned him the misconduct. Evans, who never threw a punch, was given no penalties at all and the Rock went on a seven-minute power play, scoring three goals. The Rock had a seven-goal lead at one point, but it dwindled to four with almost eight minutes left, so this was no blowout until the very end. Still, the Roughnecks seemed to get more and more frustrated (possibly with hitting the number of posts and crossbars that they did – they were banging more iron than a blacksmith), and both Andrew McBride and Shawn Evans got unsportsmanlike conduct penalties within the last five minutes of the game. So with this win, did the Rock cement themselves as the best team in the league? Arguably yes, and they do have the best record, but given the parity in the league it’s hard to say they’re far and away the best. They’ve also played two more games than Rochester and Buffalo, and three more than Philadelphia so we’ll have to let them catch up in games played before we can make a meaningful comparison. It took me over two hours to get to the ACC from my house. With no traffic, I can make it in 45 minutes easy. I was a little frustrated by the time I arrived, especially since I’ve now missed the first five minutes of two games (out of three) this season due to horrible traffic on Lakeshore Boulevard. I know that nobody but me cares about that, but hey, it’s my blog and I’ll whine if I want to. Because of this, I missed the pre-game event where a couple of members of the Grey Cup-winning Toronto Argonauts brought the Cup onto the field. The two captains Colin Doyle and Andrew McBride met the players, but after McBride declined to drink some beer from the Cup, the Argo player (Adriano Belli) poured beer over McBride’s head. There are a number of tweets from Roughnecks players and at least a couple from Rock players expressing their “disgust” over this. I can’t say I’m outraged but I agree this was a classless move. I don’t follow the CFL at all (and had never heard of Belli before this), but I’m pretty disappointed that a pro athlete would choose to disrespect a fellow pro athlete like this. I think an apology should be forthcoming from Belli and the Argos. After starting the season 2-8, I’ve gone 10-6 since. Just enough to give me confidence that I might actually know what I’m doing. Therefore, look for a 1-4 week. Last week I said this about the Philadelphia-Rochester game: “I have a weird feeling about this one” and then picked Philadelphia. Shoulda just taken a Rolaids for that weird feeling. I also got the Toronto/Minnesota game wrong, though in fairness (Warning: cheap excuse ahead) I did say that if Crawford returned I was less sure about my pick, and Crawford did play. WAS @ EDM Looks like the 2012 Stealth are gone, and the 2010/2011 Stealth are back. They are second in the west, tied for most goals scored. The Rush are what they were last year – struggling to score goals but doing very well in the defense department. No brainer, right? No such thing in this league, buddy. But I’m still betting on Washington. CAL @ TOR This will be a fun one. Both teams are stacked offensively and have great goaltenders so I don’t know if this will be a blowout one way or the other, a defensive battle, or a 18-17 slugfest. Could be any of them. Toronto is 5-7 at home in 2012 and so far in 2013, and I’ve heard everyone from owner Jamie Dawick to GM Terry Sanderson to a handful of players talking about how they have to play better at home. I can think of no better challenge than having the Roughnecks come in on a four-game winning streak. The Rock did beat the Roughnecks earlier this year, but they were Dobbie-less and hadn’t clicked yet. I hate to pick against my Rock, but Calgary scares me. EDM @ COL This is kind of backwards to the Washington/Edmonton pick above: Edmonton’s defense is doing well and the Mammoth are struggling. The Mammoth is one of only two teams who have scored fewer goals than the Rush. Can they break out and score 15? With Junior on your team, definitely. But they only scored 6 against the Stealth and they’ve been more focused on their goaltending than their offense recently. Rush in a close one. CAL @ MIN Minnesota played very well in their game against Toronto last week, though they did give up the lead in the fourth quarter. But they didn’t give up entirely, scoring twice in overtime. One of those goals even counted! And this against the top team in the league. This time they’re facing the Roughnecks, the #2 team in the league (and if they beat the Rock on Friday, they’ll be the #1 team). Not sure the Swarm can pull that off two weeks in a row. BUF @ ROC Toughest game of the week to call other than CAL@TOR. The Knighthawks have been too strong over the last week or two while Buffalo has been consistently inconsistent and is still without JT. There have been a few things I’ve wanted to write about but they weren’t really enough for a whole post. So I came up with the completely original idea of combining them all into one post. I know, right? Brilliant! IKnowLax – “a person who has had a long experience in a particular field” I’d say 2 years. You’re not considered new at a job after that. …a guy like Cody Jamieson I would consider a vet. apmckay – To me a veteran is someone who’s been through enough he can guide others through it too. Wings-4-Life – My cutoff is 5 full years. I do not consider Jammer or Billings to be veterans. @podcasterryan – For me it’s 3 full seasons. In your fourth year you are a vet. poskid – I like four years. Might be because the Swarm are so young and lasting four years here means something. swami24 broke it down even further: You are a veteran at the start of your third full year. You are a seasoned veteran in your 6th season and a grizzled veteran in your 10th. So we don’t have a real consensus, but it looks like most people would consider a player a veteran after they had finished 3-4 years. Personally, I’d give it a couple more years – after five full years I’d probably use the term veteran. I might drop it to four if the player had had a significant impact, so I might give Jamieson that honour next year. Unlike Spinal Tap the magic number is not 11. It is 12. If you can pop 12 then your winning % will be 75% and better. Probably a lot higher. Of course, that made me curious, and I jumped into action. It’s not that I was trying to prove Pym right or wrong, I was just curious as to how true that was. It shouldn’t really be that surprising that Pym’s impressions after all of his years in lacrosse were pretty accurate. Over the history of the NLL (not including any games from the 2013 season), the the average losing score was 10.6 (the average winning score was 14.4 in case you’re wondering). The median losing score is 10, so if you want to give yourself a >50% chance of winning, scoring 11 would do it, but just barely. Scoring 11 goals would have won you 51.6% of all NLL games. Scoring 12 would give you a much higher 64.6% winning percentage, and if you wanted to hit the 75% mark, you’d need to score 13 (which would actually give you 76%). While watching the Calgary / Edmonton game a couple of weeks ago (not last week’s 9-8 nailbiter, but the 18-15 goal-o-rama game the week before), I thought I was watching a basketball game: there was lots of scoring and the last few minutes of the game took forever. I wasn’t the only one either; lots of people on twitter felt the same way. The reason for the frustration was the fact that there were three goals scored within the last two minutes of the fourth quarter, the time during which no goal challenges are allowed. Instead, the referees will automatically review every goal during those two minutes. This apparently includes included empty-net goals. I get the idea of this rule. If a coach challenges a goal and the challenge is overturned, his team loses a timeout. If they don’t have a timeout remaining, they get a bench minor penalty. But if there aren’t two minutes left in the 4th quarter, the team can’t serve the whole two minutes, so there’s less of a risk to calling for a challenge. To avoid frivolous “nothing to lose” challenges near the end of a game, they simply take away that possibility and review every goal, negating the need for a challenge. But I expected that the rule was written to say that all goals in the last two minutes of the 4th were reviewed if necessary. If there is no question that the shooter was outside the crease, none of his teammates are near the crease, and the ball went in before the whistle, shot clock expiry or final buzzer, there’s no need to review it, right? Apparently not. Even worse, both of the empty-net goals were reviewed. The fact that these goals were reviewed at all is frustrating enough. But when the reviews take two minutes or more, we start to get into “ridiculous” territory. They showed the replay from a couple of different angles during the telecast, and there was no question that the goals were good. There’s no reason those reviews should have taken more than about fifteen seconds. I have no idea why they took so long. The fans watching on twitter, those in the stands at the game, and even the announcers calling the game were similarly stumped. Some of the suggestions I saw on twitter were to limit the time that a review could take (i.e. if the ref can’t figure it out within 30 or 60 seconds, the call on the floor stands), or allowing the coach of the team who was scored on to waive the review. The problem with the second option is that if the losing team is gaining momentum in the last two minutes, the scored-on coach would not waive the review because he wants to kill any momentum the scoring team might have had. But momentum is being killed anyway, so they need to do something. Thankfully the NLL announced a couple of days later that empty-net goals in the final two minutes of the fourth (or OT) are no longer required to be reviewed. While this is a great addition, I would have preferred the rule be changed to give the referees the ability to decide for themselves whether a review is necessary. A lot of people complain about the refs in the NLL, but the league has to show enough confidence in them to allow them to see a goal and make a judgment call as to whether it needs reviewing. Maybe they can err on the side of caution and say “If it’s close at all, review it”. Either way though, kudos to the NLL for addressing this issue quickly. Last year, I seem to remember some trepidation about Chris Levis being the Mammoth’s starting goalie. Was he up to the task? By the end of the year, however, there were no doubts, and Levis placed third in IL Indoor’s Goaltender of the Year race (even getting one first-place vote). It seemed that many people forgot about this over the summer, though, since I saw a lot of people remarking at the beginning of this season that Colorado’s biggest question mark was goaltending. Now maybe Levis had a bad summer in the MSL or WLA, or got injured while windsurfing or something, and I didn’t hear about it. But it seemed to me that if Levis was one of the best goaltenders in 2012, there shouldn’t be much of a question about him in 2013 before any games have been played. Sure enough though, Levis didn’t have a great start to the season and was released. Matt Roik, who had been brought in during the off-season as Levis’ backup, was given the starting job. But when the Mammoth signed Dan Lewis to back up Roik, I saw tweets from people talking about how the Mammoth had solved their goaltending problems. Really? Dan Lewis is the answer? Nothing against Lewis, about whom I know very little, but his entire NLL career consists of nine minutes during which he allowed 4 goals and made 10 saves. That’s not much to go on. That said, as of now Lewis has played 8 minutes. He’s got a 9.25 GAA and 87.5% save percentage. Not bad at all.